Not many of us carry radios in our pockets any more. Small portable TVs became passé decades ago. Smartphones, tablets and other portable Net-connected devices are now the closest things we have to universal receivers and transmitters of live news. They’re what we have in our pockets, purses and carry-bags. I just looked at ABC, NBC, CBS, Fox, CNN, CBC and BBC online, and all have recorded reports. None have live coverage on the Net. They are, after all, TV networks; and all TV networks are prevented from broadcasting live on the Net, either by commercial arrangements with cable and satellite TV distributors, or by laws that exclude viewing from IP addresses outside of national boundaries. Television has become almost entirely an entertainment system, rather than a news one. Yes, news matters to TV networks, but it’s gravy. Mostly they’re entertainment businesses that also do news. This is even true (though to a lesser degree) for CNN. At NBC.com, you won’t find that anything newsworthy has happened. The website is a bunch of promos for TV shows. Same with CBS.com, Fox.com and ABC.com. Each has news departments, of course, which you’ll find, for example, at Foxnews.com (which is currently broken, at least for me). Like CNN and BBC, these have have many written and recorded reports, but no live coverage (that you can get outside the U.K, anyway, in the case of BBC). Thus TV on the Net is no different than print media such as the New York Times. None. Hey, the Times has video reports too. NPR has the same problem. You don’t get live radio from them. Still, you do get live radio from nearly all its member stations. Not true for TV. Lots of TV stations have iPhone, iPad and Android apps, but none feature live network video feeds, again because the networks don’t want anything going “over the top” (of the cable system) through Net-connected devices. This is a dumb stance, in the long run, which gets much shorter with each major breaking news story. Here’s the take-away: emergencies such as wars and earthquakes demonstrate a simple and permanent fact of media life: that the Net is the new TV and the new radio, because it has subsumed both. It would be best for both TV and radio to normalize to the Net and quit protecting their old distribution systems. Another angle: the Live Web has finally branched off the Static Web (as I wrote about in Linux Journal, back in 2005), and is fast becoming our primary means for viewing and listening to news. To borrow a geologic metaphor, the vast tectonic plates of TV and radio are being subsumed along their leading edges by the Live Web. 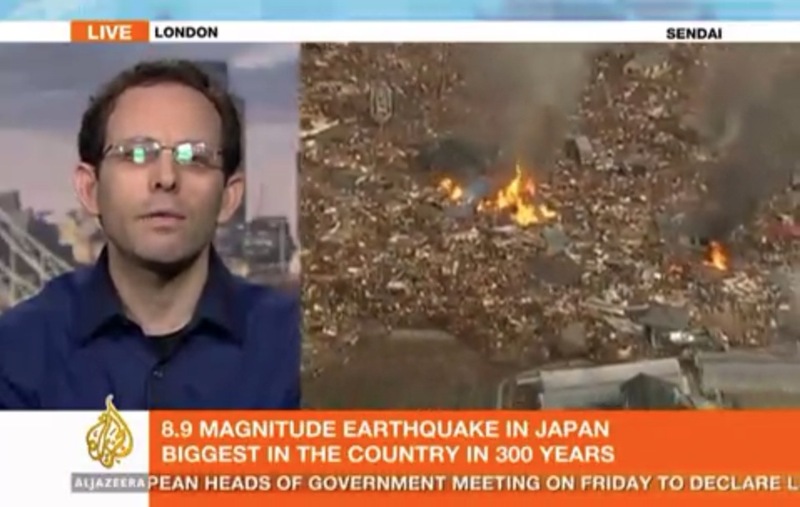 Thus today’s wars and earthquakes are tectonic events for media old and new. The mountain ranges and civilizations that will build up along the new margins will be on the Live Web’s plate, not the old TV, radio and print plates. Meanwhile, back to your irregularly unscheduled programs. Joey Trotz reports that http://cnn.com/live has four live streams. And, as others say below, so does the BBC. All can be viewed on a browser with Flash, and a disabled popup window blocker. Therefore some laptops and Android devices should also be covered, to a degree; but it’s all bit of a kluge. To me the standard is a live stream using at least a relatively open standard like .mp3 for audio and whatever-it-is that Al Jazeera is using for video (on the iPhone and iPad, at least, it can’t be Flash, so what is it?). The key: ease of viewing (fewest clicks) or listening. This means an app, usually, as of today. Note that nearly all smartphones in use today will be old hat two years from now. I just downloaded and added the CNN app to my iPhone. It has “live” in its tabs, but the picture isn’t moving for me. Not sure what that means. Thanks to Danilo, in the comments below, for suggesting that I make clear some distinctions that at least a couple commenters have missed. I do that in this comment here, and I’ll say it here as well. This post is not a slam on the good work that broadcasters do. Nor am I declaring the death of TV and radio as we know it. I am using AND logic here, not OR. When I say the Net is subsuming radio and TV, and that broadcasters need to normalize to the Net, I am saying that the Net is becoming the base medium. Broadcasters need to be streaming online as well as over the air and over cable. Back when he renewed his contract with SiriusXM, Howard Stern said as much about satellite radio. The new base medium for Howard’s SiriusXM channels, as well as all the other channels in the satellite radio lineup, is the Internet. Satellite distribution will become the backup live stream service, rather than the main distribution system. This is why Howard has been out stumping on TV talk shows for the SiriusXM smartphone app. Yes, it is true that the satellite system will cover many areas that the cell and wi-fi distribution system will not. But the reverse will also be true. SiriusXM on the Net is a global service, rather than one restricted to North America. The service is also not capacity-limited in the number of files and streams that can be offered, which is the case with satellite alone. Another point I’m making is that TV networks especially are restricted in their ability to stream by the deals they have with cable companies, and (in the case of, say, the BBC) by blocked use over IP addresses outside national boundaries. These are severely limiting as more and more viewing moves to hand-held devices. And those limitations need to be faced. Al Jazeera shows what can be done when the limits aren’t there. I am living in Japan. But fortunately for me, not anywhere near the area devestated by the tsunami. There are currently gas shortages and scheduled power outages. Although, today, the power did not go down as planned. Hugh, a few years ago Real decided to open souce at least some of that they do. Helix is the project: https://player.helixcommunity.org/. A bold statement, TV networks are ll entertainment, yet, it seems true. It is funny though, that when an event such as this occurs how people suddenly find themselves lost. That iPhone or Tablet won’t work very well if the Cell tower is Down, or the Power is Off to the Datacenter. That old wind up radio is perhaps STILL the best thing to have.. I couldn’t agree with that statement more… I have for a number of years now relied heavily on the internet for real news rather than glossed up bits and bobs that the networks pump out. Its getting worse here in the UK as well. I am living in Japan too, I hope we can recover quickly.